Wright State University places the safety and security of its students, employees, and visitors as its highest priority. To keep you informed in emergency situations, Wright State has developed a comprehensive emergency notification system. The purpose of this system is to keep students and employees informed about emergencies and life threatening situations on campus. The goal is to provide numerous methods by which to share emergency information to ensure the most people receive the notification as quickly as possible. You may choose to receive alerts for the Dayton Campus, Lake Campus, or both. If you travel between campuses, it is recommended that you select both campuses. When you click the Save and Continue button on the WINGS Express, Wright State Alert! – Emergency Notification page, a new page will open. You can manage all of your contact information on this website except for your official @wright.edu email address and password. Hover over buttons to edit or add. What is Wright State Alert? 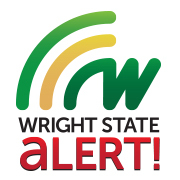 Wright State Alert is the branded name for Wright State University’s emergency notification system. It is a safeguard that offers multiple methods of communicating notifications and information about real and potential life threatening situations to the university community. Wright State Alert is currently a broadcast-only system. Wright State currently contracts with Rave Mobile Safety for our emergency text and voice messaging options. If I have an emergency, can I send a message through Wright State Alert to request assistance? Wright State Alert is currently a broadcast-only system. It is intended to send out and/or post timely information about real or potential life threatening situations. Review Wright State's Emergency Action Plans for Dayton Campus or Lake Campus for a brief overview of how you should prepare for and respond to most emergency situations. Do I need to sign up for Wright State Alert? Yes and No. If you want to receive emergency text and/or voice messages about the Dayton and/or Lake campuses, then yes – Visit Managing Your Wright State Alert Account. Otherwise, no – The campus wide building notification system is an integral part of our fire alarm system. Other alert methods utilize communications channels that have been in place for some time, like wright.edu email, the Wright State University and WINGS homepages, local radio and television stations, and Wright State University Information lines. Those channels continue to support our day-to-day communications needs. Am I required to have a Wright State Alert account? Yes, you are. Wright State University is required by federal law to have a method in place to alert you of an emergency. Your Wright.edu email is the minimum push notification method that complies with the federal requirement. Therefore, your name and wright.edu email address are uploaded daily into an account at Rave Mobile Safety. Do I have to sign up for Wright State Alert text or voice messages? No. It’s your choice. But here’s something to consider. When Wright State needs to alert you of a campus closure or if a serious incident threatens the people on campus, the more ways you can be notified of the threat, the better chances you have to avoid and/or respond to that threat. Will I receive information about campus activities and student organizations from Wright State Alert? No. Wright State Alert is dedicated to emergency notifications only and includes campus closures and delays in opening campus resulting from severe winter weather conditions. When you see “Wright State Alert” on a text, email, or website post, take the notification seriously. Read it and take the appropriate action. I am receiving Wright State Alert emails from the Dayton and Lake campuses but I never logged on to manage my Wright State Alert account. Will you please make it stop? Only you can change your settings. The default setting is to receive Wright State Alert emails from both campuses. Visit Managing Your Wright State Alert Account to find out how to choose which campus alerts you want to receive. While you are in your account, consider adding more methods by which you can be notified about an emergency or campus closing. I want to add another email address and phone number to my account so Wright State Alert messages will be sent to those locations. Can I do that? Yes. In fact, you can an up to two more email addresses as well as up to three mobile phone numbers to receive texts and voice messages and three voice-only phone numbers. Visit Managing Your Wright State Alert Account. Can I add my parent’s email address and phone numbers? Absolutely. Feel free to add family member or close friend who you believe should know when a Wright State Alert has been sent. Visit Managing Your Wright State Alert Account. Why do I receive a Wright State Alert voice message when I didn’t sign up for it? 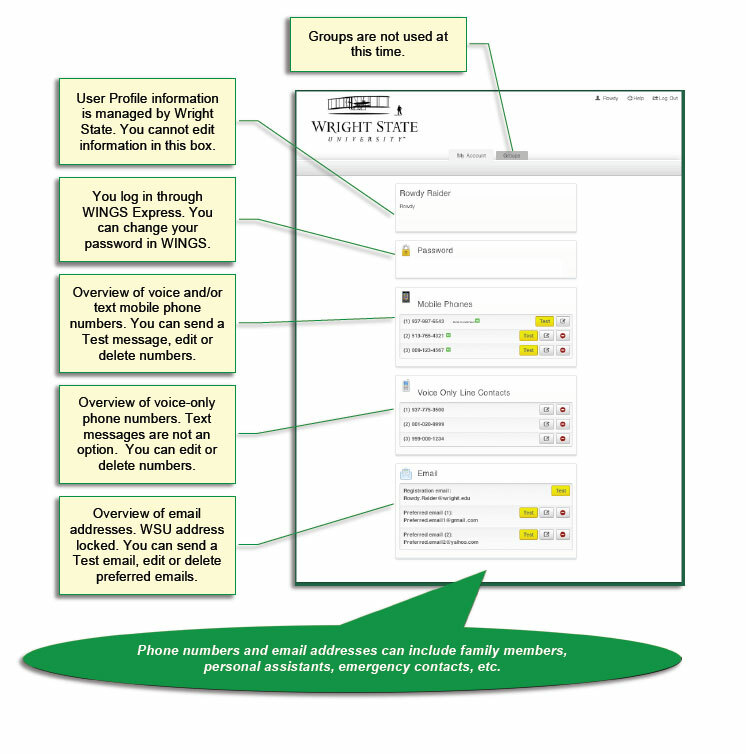 When your Wright State Alert account includes mobile phones, the system default is for each number to be sent a text message and a voice message. If you do not want to receive a voice message on a mobile phone, Visit Managing Your Wright State Alert Account and review “Edit Mobile Phone Number” to opt out of voice messaging. Will all of the Wright State Alert notification channels be used when there is an emergency? No. Depending on the situation, only one or a combination of the notification channels will be utilized. For example: If the National Weather Service issues a tornado warning affecting the Dayton campus, the campus wide building notification system and the outdoor warning sirens will be activated; If the Dean of Lake Campus delays the opening of Lake Campus until noon due to a winter emergency, all Wright State Alert channels except the building notification will be used; If an active shooter is on campus, all Wright State Alert channels will be used. Most other emergencies are situation dependent and the Wright State Alert channels to be used are determined by a Crisis Management Team. I’m on Facebook and Twitter throughout the day. Do you use social media to alert us of an emergency? Wright State does not consider social media sites as primary methods of emergency notification. However, they do provide a means to send out information about an emergency as a secondary channel. Visit www.facebook.com/WrightStateAlert and www.twitter.com/wrightstalert. Will I be charged for the Wright State Alert service? No. However, depending on your service plan, your service provider may charge a small fee when Wright State sends you a voice or text message to your mobile device. How fast will I receive a Wright State Alert text message? It depends. Experiences with Rave Mobile Safety suggest within minutes. However, as with any incoming message or call to a mobile device, signal strength and other issues with your carrier could impact delivery to your phone. It is important to note that text and voice messaging to mobile phones have proven to be unreliable, particularly during an emergency when the number of messages sent and calls made can overload a carrier's system. For that reason, text and voice messaging via mobile phones should not be considered your primary source of emergency notification. Do you test Wright State Alert to make sure it really works? Wright State will normally test its emergency notification system at noon on the third Wednesday of each term, excluding summer sessions. An informational email will be sent to you via Official listserv (that’s your wright.edu email address) a few days prior to the test date. Will all mobile phone carriers deliver Wright State Alert text and voice messages? Rave Mobile Safety works with a long list of mobile phone carriers. If yours isn’t automatically identified when you register your mobile phone number, a pull-down list will appear and you’ll be asked to choose your carrier. If it isn’t listed, you can type in the carrier and Rave will determine if it can be supported. Why can’t I change my password in my Wright State Alert account? Your Wright State Alert account is accessed through your WINGS Express account. Essentially, your Wright State Alert account password and your WINGS password are one and the same. I don’t have a mobile phone. Can I receive voice messages on my home phone? Yes. When you sign on to your Wright State Alert account, find “Voice Only Line Contacts” and click “Add.” Enter your phone number and save. You can have up to three voice only phone numbers and include mobile, landlines, and VoIP. I have a mobile phone but I don’t text. Can I receive voice messages on my mobile phone? Yes. When you sign on to your Wright State Alert account, find “Voice Only Line Contacts” and click “Add.” Enter your mobile phone number and save. What if I change carriers? The system should automatically identify your new carrier. However, it is a good idea for you to sign on to your Wright State Alert account, find your mobile phone number that has the new carrier, and click the yellow “Test” button. A test message will be sent to that phone. If you do not receive a test message, click the “Edit” button, verify that your number is correct and click “Continue.” You will be prompted to confirm your carrier. What if I change phone numbers? You’ll need to log on to your Wright State Alert account and add the new number as a new mobile phone or voice only line contact. Don’t forget to delete your old phone number from the system while you are logged on. Absolutely not. The information will only be used by authorized system administrators at Wright State to notify you of a real and potential life threatening situation to the university community. The caller ID number comes up 937-775-8888. Why? Though this number and the voicemail attached will NEVER be a source of information during an emergency, the university intentionally provided the 775 prefix so Wright State Alert users can have confidence that the message is coming from Wright State University. The voicemail for this number will ALWAYS point users to wright.edu or their wright state email address for updates about the emergency. I don’t have access to WINGS. How do I access WINGS Express to manage my Wright State Alert account? Go to http://wingsexpress.wright.edu and follow the instructions at Managing Your Wright State Alert Account. If you still can’t access your information, call the CaTS Help Desk at (937) 775-4827 or email your issue to helpdesk@wright.edu. I want to stop receiving emergency text messages. Can I do this without logging into my Wright State Alert account? You can opt out of emergency text messaging at any time by texting STOP to 67283 or 226787. However, if you are an active student and/or employee, we encourage you not to opt out. The more Wright State Alert channels you can be notified through, the better chance you have of learning about the emergency. If I have questions about Wright State Alert or emergency management in general, whom do I contact? Visit the Emergency Management website or send an email to emergency_management@wright.edu. Administrative Office: Monday–Friday, 8:30 a.m.–5 p.m.